A hundred awesome things arrived in the mail today. 290 pages from around the world. Yes, I’ve written about 100 Stories for Haiti a lot over the last month-and-a-half, from hearing about the project in late January to teasers from the first 34 stories last week. (I was going to link to all the entries individually, but you know what? Here – I’ve made it easy to catch up by doing the blog search for you.) But I’m humbled and amazed and proud to be a part of it, and if Ive babbled and badgered even one person in to buying a copy – electronic or paperback – choose your own! – then the Red Cross relief effort wins. So even though I’ve been reading my e-version, I was thrilled to find the actual paperback in my mailbox this afternoon. And it turns out there are way more than a hundred awesome things in here. That is a lot of good stuff packed into a little package from Liverpool. 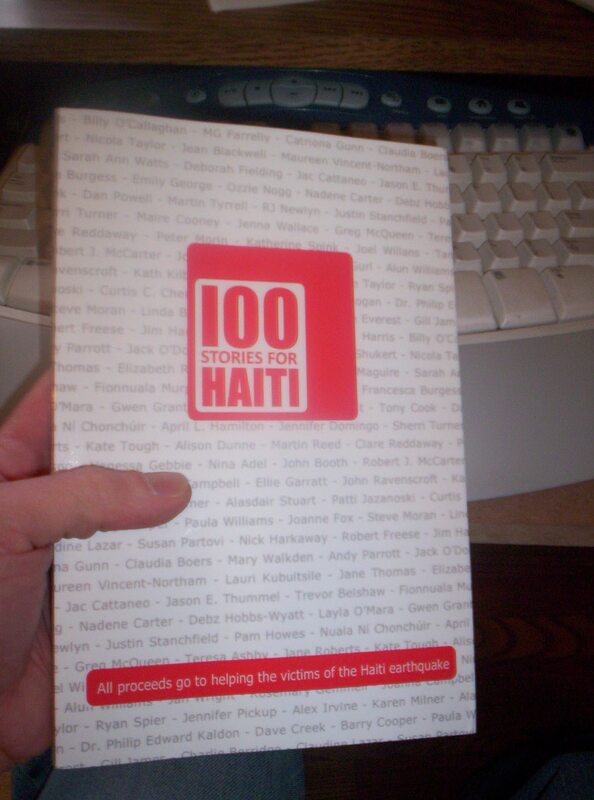 You’ll find some slice-of -life, some meta, some science fiction, some fantasy, and a whole bunch of good quick reads in 100 Stories for Haiti. I’m just over a third of the way through my electronic edition, and already I’ve gotten way more than my money’s worth. Rather randomly in some cases, I’ve picked out one sentence from each of the first stories, plus, because it worked out well, exactly one-third of a sentence from the thirty-fourth story, hoping to pique your interest and give a little idea of what a tremendous variety of writing is in here. Enjoy – and then go buy your own!